As I dug into my raspberry meringue sandwich, eyes wide, I took plenty of pictures so I could recreate the splendid dessert at home. I flicked the top shell off with my fork, snapping a photo of what lay underneath. Then I moved the cream out of the way and took another photograph. And so on. And so forth, working methodically from top to bottom. The friend I was with laughed as I dissected Ansel’s creation. “You know,” she said, “I hate when people take photos of food. In this case, however, you have a reason.” While waiting for her to clearly specify whether she thought my intention to reverse-engineer Ansel’s dessert allowed for the jettison of social convention, I chewed. Good photos were critical since Ansel’s dessert is equally a feat of engineering as it is a feat of pastry. As one of the attendants explained during the autopsy, “Correctly layering the ganaches is important in the pavlova to ensure its structural stability.” Since one cream is thin and the other thick, and because so much is going on between the two meringue shells, it is not hard to imagine an improperly-assembled iteration quickly falling apart. For my homemade version, I worked off of the photographs I had taken and the official description of the dessert. I did, however, make a couple of changes. To start with, I removed the lychee flavouring from the meringue shells. At first, I had decided to do this simply because I was not sure how to make a lychee-flavoured meringue. Then, after further research and the realization that Ansel probably just folds in some crushed freeze-dried lychees, I decided that the hassle of getting those was not worth the minuscule flavour difference in the pavlova. Second, while Ansel has two ganaches in his version, I cut the white chocolate out of one of the ganaches and labelled it a crème instead. Removing some of the white chocolate lowered the sweetness level in the pavlova, making the dessert lighter and allowing the fresh, slightly-tart berries to shine. Finally, instead of making my own raspberry jam, I bought a ready-made jar in the store. (Gasp! Please don’t unsubscribe.) While I love homemade jam, there is so little of it in this pastry that taking the time to make a batch just did not make sense. Plus, subbing in store-bought jam for the homemade stuff makes this recipe much faster to prepare. I wanted something relatively simple after my canelé tutorial. The end result was really nice. This is not a heavy dessert at all; just the opposite in fact. The pavlova is light and a perfect ending to any meal. The recipe is also easier than most of what I post, which is a nice plus. Of course, you can always make it even easier by baking it as one big “pastry” instead of ten smaller ones like I did. A reverse-engineered version of famous pastry chef Dominique Ansel's raspberry and lychee pavlova. Line a large baking sheet with parchment paper. Trace out 2.75'' (7cm) in diameter rounds with a pencil if you would like guidance while piping the meringue. Flip the parchment paper over. Whisk in the corn starch, vinegar, and vanilla extract (if using) for about one minute. Transfer the meringue to a pastry bag fitted with a large, circular pastry tip (I used Wilton #12). Pipe out blobs 2.75'' (7cm) in diameter onto the parchment. (You can also use a little bit of meringue to stick the parchment to the sheet pan.) The easiest way to do this is to hold the pastry bag perpendicular to the baking sheet, near the center of the desired blob, and then push down from the top of the bag while not actually moving it. For an easier (yet less pretty) alternative, use a spoon to divide the meringue or just make two big ones. Using an offset spatula, gently flatten just the tops of half of the meringue blobs. Later, these will be flipped upside down and act as the base. I suggest flattening the uglier ones..
Bake for 1 hour 30 minutes and then turn off the oven. Leave the oven door closed and let cool completely, at least four hours. You can leave the meringues in overnight if you wish. Just don't open the oven door! Store in an air-tight container, at room temperature, until ready to use. Sprinkle the gelatin over the water in a small bowl and stir to combine. Let sit for five minutes. Meanwhile, prepare the lychee purée by straining a can of lychees. Blend the fruit until smooth (you can use a food processor instead if you wish). Strain out 50g of the purée into a medium saucepan. Add the whipping cream and the scraped vanilla bean/vanilla extract to the lychee purée and bring to a simmer over medium heat. Once simmering, remove from the heat and stir in the gelatin. Place the white chocolate in a large bowl. Pour all of the whipping cream and lychee mixture in. Let sit for two minutes, and then slowly whisk together until smooth. Remove the vanilla bean, if using. Scrape the vanilla bean into a bowl with the cream, mascarpone, and sugar. Whip with the whisk attachment until smooth, about three minutes on medium speed. Whip the lychee ganache at medium speed for about two minutes, or until smooth. Place one of the flattened meringues flattened-side down. Pipe a tall, yet narrow, mound of ganache in the center. 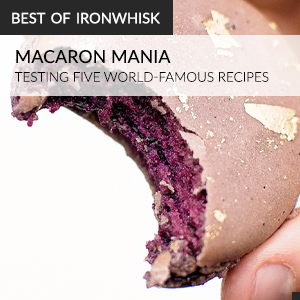 Arrange raspberries in a circle around the ganache, with openings facing outward. Pipe small dots of raspberry jam in between the raspberries. 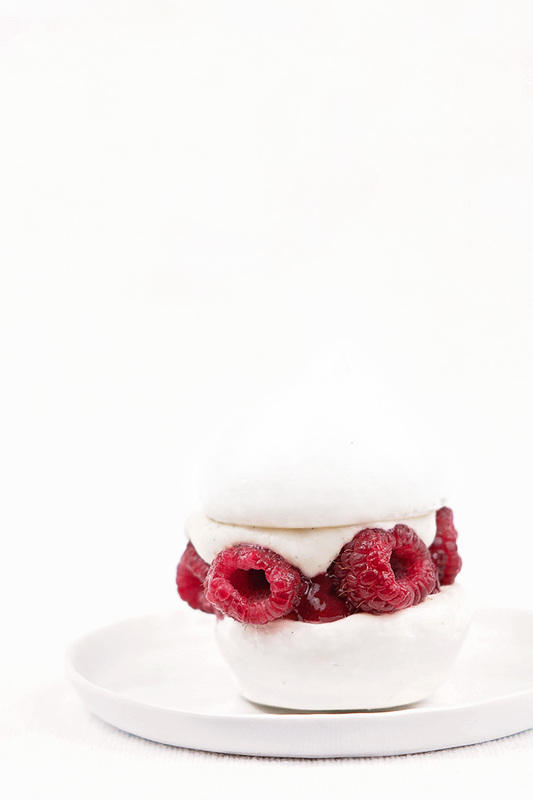 Then, almost cover the raspberries by piping the mascarpone crème on top. Cover with another piece of meringue, pressing gently, to form a meringue "sandwich".